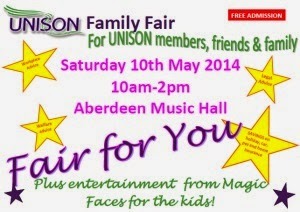 UNISON’s first local Family Fair was hailed a great success both for those who came in to browse the stalls and enjoy the activities, and for the stall holders who were able to build networks for the future. Local Organiser, Lyndsey Wallace said, “There was a steady flow of people, both adults and children, who came through the doors. They learned a lot about the money saving benefits of UNISON membership, and the kids had a ball at the fun activities. Lyndsey thanked all those involved in helping to run the event and those who staffed the stalls. “We will now looked to build from this event to let more and more of our members know what UNISON has to offer them,” said Lyndsey.